Anurag was nervous about Sumitra’s and Mahir’s arrival. P:Anurag…don’t get tensed.Everything is alright. Finally Sumitra and Mahir arrived. Anurag and Prerna could’nt take their face off Mahir.His face had love,affection,humbleness,simplicity and innocence. Sumitra:We have come here for my son Mahir. Anu:We know and we are grateful for that. Sumitra:Before we get into a relationship I have to confess something. Sumitra:Mahir is not my real son.He is my step son. Anurag,Prerna,Sooraj And Manjari were shocked. 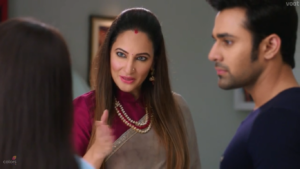 Sumitra:But please don’t reject Mahir just because of this.Though he is not my real son he is like my own son.After his mother’s death his father married me to look after him.From then I have given him love and affection. P:Your love for Mahir is seen on your face.We are happy to get a son in law like Mahir. Sumitra:Thanks a lot for accepting my Mahir.Where is Bela?I am dying to see Bela. Manjari:We will bring Bela now. Manjari and Kalyani brought Bela.Mahir could’nt take his eyes off her.She was looking gorgeous in her blue saree.Bela blushed seeing Mahir looking at her romantically. Sumitra:I have to admit that my Mahir has chosen an Angel.I liked Bela very much. Sumitra:Now let us fix their wedding. Anu:Why not?We are so happy. Mahir looked at Anurag and Prerna emotionally.Then he fell at their feet. MAHIR:I don’t have words to thank you all for giving me Bela.She is the most wonderful gift I have ever got in my life.I can’t live without her.I promise you all that I will keep my Bela happy. Anurag became emotional:Beta…Bela is gifted with the most precious thing like you. Mahir and Bela were very emotional. Sumitra got irritated seeing Mahir and Bela exchanging romantic glances. Sumitra:Now we have to leave.Thank you all. Mahir and Bela became sad. Sumitra:Don’t be sad children.Very soon the wedding will take place.Then you both will be together forever.Till then can’t you guys bear a small separation? Kalyani tickled Bela:Wow Bela…finally your marriage is fixed. Sooraj:Hey…Bela..you tickle Kalyani back as her marriage was fixed long ago with her NRI boy friend Malhar. Bela tickled her.Kalyani Bela laughed. Meera’s skin was glowing because of the haldi paste. Kalyani:Meera,i heard that haldi makes the skin glow.On your wedding you will be very beautiful and Yash will be flattered. Bela was smiling at Meera.Mahir was watching her and smiling.Bela saw him smiling at her.She blushed. Mahir rested his chin on Bela’s shoulder. She was even more shy. Bela walked away slowly.She was still blushing.Mahir followed her. Bela reached another room.Mahir stood close to her with a smile. Mahir whispered in her ears:I love you Bela. MAHIR:Today is Yash-Meera’s haldi function.Let us have haldi Bela. He took haldi from the near by bowl and slowly put it on her cheek. The way he put haldi softly on her face was romantic and sensuous.Bela kept looking at his expressive romantic eyes. Their eyes got locked onto each other. Mahir’s hands travelled from her fingers to the shoulders romantically. Suddenly Bela took haldi and put it on his face.Mahir was happy as it was a surprise.Bela smiled. Though Mahir knew about her love for him when she said that for the first time he felt different and happy. MAHIR:If you love me then marry me Bela. She blushed:Very soon we will be married.Right? MAHIR:I can’t wait anymore.Marry me now. and put it around his neck. MAHIR:Now we are married Bela. He wiped the haldi on her face with his tender lips.She closed her eyes. With her finger sensually she wiped the haldi on his face. He caressed her skin.She kept blushing. MAHIR:No one can separate us. She looked at him emotionally. They looked at the romantic couple’s sculpture on the wall.Then they looked at each other romantically. Mahir made her sit on his lap.They got lost in each other. aa.Nkho.n kii gustaakhiyaa.n …(Hum dil de chuke sanam). At night Bela was thinking of their secret wedding and smiling. Mahir was also not able to sleep thinking of the wedding. MAHIR:I miss you Bela.Even for a moment I don’t want to be away from you. Very romantic epi. The wish of a fan has fulfilled i asked 2 write mre romantic scenes and here it is wow! Really wen bela nd mahir applied haldi the way u wrote send shivers through my veins U DESCRIBE each and everything lyk real semma NOW MY CURIOSTY 2 KNOW Y THEY SEPARATED IS EATING MY BRAIN bt i guess it might be bcuz of sumi lets wait nd watch 2days epi was sensuous really i want mre b4 tey get separated wil u? Lovely episode. They are going to fix their marriage. Haldi scene is so romantic and intense. They married eachother secretly. Nice. Mahir is so nice, he told Bela is his happiness. Guess Sumitra is the one who is reason for their breakup. Eagerly waiting to know why they got separated and also where is Sooraj and Manjari at present.